This was a very simple, and exceedingly quick look I created in about three minutes flat this morning. 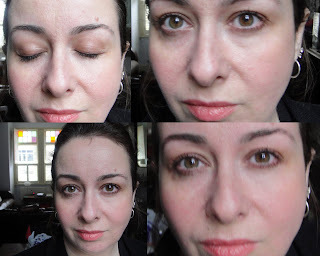 After applying foundation (Rimmel Stay Matte in 200 Soft Beige), I used E105 on the eyes, darker on the mobile lid, and sheered out with the fingers towards the brow-bone. Eyes were finished with Clarins Wonder Perfect. Then I used S302 on the cheekbones – I love the subtle flush of sheerly shimmering colour you get with this! – and finished with L307 on the lips, which is a lovely, and surprisingly wearable, coral shade. I won’t lie, there is a learning curve to using the Ellis Faas products, the applicators can be temperamental until you get used to them (not helped by the fact that I think the nozzles on my blush are all blocked bar one) but they’re worth it as the eye and cheek products barely budge during the day. The hard part is actually not applying too much! This look was a lot brighter and more glow-y in the flesh. I loved it, as it was natural and not too much for a day in the office. Do you have any Ellis Faas? Is it a brand you’ll be checking out when it arrives in Liberty next month? Next Post (Almost) Organic Wednesday Liz Earle + Giveaway! The blush looks lovely! Do you think I could get a wee try of it if I promise to not sing 'All that Jazz' at you tonight? I just really like the way that the eye and cheek stuff stays put all day without fuss. Lovely lovely look on you. I might have said it before. The blush looks absolutely gorgeous on you! I love the shade. About the applicator thing, I'm encountering one or two issues too.